John Carter’s ABC for Book Collectors – Everything is Oll Korrect! So, who should buy a copy of ABC for Book Collectors? It certainly fulfils its purpose for the target audience of beginning collectors and it will likely come in handy for experienced collectors, as well. For people like me who buy a lot of books but don’t seriously collect them, it’s not necessary but can be helpful. When buying used books I occasionally see some of the technical terms defined here, so it is occasionally useful. Also, it’s just fun to flip through occasionally to learn a new term or get an H.S.O. on the heroes and pests of the book-collecting world. 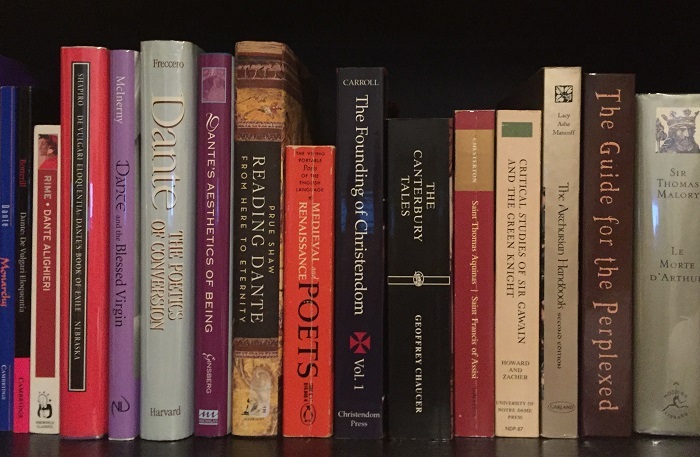 Part of the “Medieval” shelf of my personal collection, such as it is.